If you know me, you know I love my gadgets. I’m not sure when it started. There was once a time in the ’90s when I had a cell phone (the size of a brick) that just lived in my purse and never saw the light of day, its plaintive ring falling upon deaf ears. But gradually, I began to embrace technology and today, I’m a full-fledged gadget girl. I panic if I leave home without my Blackberry Bold and my iPod Touch. And my MacBook … well, that’s just become a new appendage, a totally essential extension of my body. But almost as much as I love my gadgets, I love the accessories that I can dress ’em up with. When I first got my iPod, it was difficult to find a nice case that fit, offered protection from the perils of my purse and looked fab all at the same time. Nowadays, there are plenty of options on the market. Take, for instance, these cases (pictured above) from fabrixcases.com. Originating in Singapore, these pretty protectors can ship to anywhere in the world ($3 shipping to Canada!) and the cases are only about $20! There are tons of designs in an array of lovely colours. I love the gingham pattern pictured here and the damask pattern; visit the site to check out all the wonderful designs. 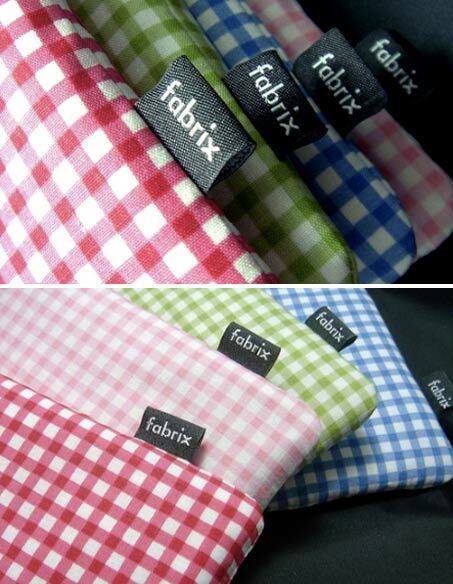 Fabrixcases.com offers stylish cases for iPods, iPhones, laptops, cameras, Nintendo DS and even external hard drives. Oh, how I love the Internet for opening up our options! Now I needn’t worry about my tech toys when I travel, knowing that they’re well-protected (stylishly, too!) and safe.